That’s a question I recently fielded from a Christian business person who was struggling with the idea that his business could be a ‘Biblical business.’ While the simple answer is “No,” the mind-set behind the question requires quite a bit more explanation. First, a little background. 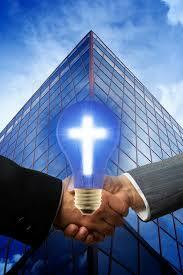 The religious establishment has for generations promoted the idea that there was nothing ‘Christian’ about business. According to the clear majority of professional Christians, Christianity was what one did in church, and business was a decidedly non-church endeavor. Therefor the two didn’t mix. I recall two missionaries visiting my home in the late 90’s and ridiculing me for using my speaking practice to fund our short-term mission trips. I was a ‘charlatan,’ for mixing business and Christian ministry, and they would have nothing to do with me or my family. To them, they – professional Christians – were the custodians of the Kingdom, and no one better infringe on their territory. The idea of a Christian business was anathema to them. That idea began to change around the turn of the century, when some missionary groups, frustrated with their inability to operate in certain countries, recognized that, while their efforts to enter those countries were stopped, those same countries welcomed business investment. So, they reasoned, a business could be formed as a stealth mission effort. Let’ s hide our real objective – planting churches – under the shelter of a business and thus gain entry into places previously unavailable. Thus began the ‘Business as Mission” effort. Formed as a church-planting strategy, and primarily advanced by missionary organizations, the idea never-the-less expanded the concept of a Christian business. Now, a business could have a function in the Kingdom apart from just making money to support the institutional church. * is God’s first choice of a venue in which to interact with mankind. * builds relationship with God. * creates character in Biblical leaders. * is a venue for the application of spiritual gifts. * is a conduit for God’s blessings of material providence. * provides a community for its employees. * brings the light of the Holy Spirit into dark places of the marketplace. Now, back to the idea expressed by my client at the very beginning of this article. The idea that the only purpose of a Christian business is to provide a platform for ‘preaching the gospel’ is a vestige of the BAM idea, and is just as wrong as the original BAM premise. As a Christian business, you can bring God’s light to and through your business, to its employees, customers, vendors, neighbors and other stakeholders in numerous ways. (Read The Good Book on Business to get an idea.) That’s not to say that you may not have an opportunity to share your personal testimony with folks who are drawn to you by your Christian business walk. You have the same obligation that all Christians do — to share the Good News when the opportunity presents itself. So, you may, from time to time, find yourself presenting the Gospel. But, it is not the fundamental purpose of your business, nor should it be. Your business can have a powerful impact for the Kingdom without you feeling like you must proselytize your associates. Think of the impact Christian businesses like Chick-fil-A and Hobby Lobby have had, for example. Your business is a ministry and has the potential to be a powerful force for the Kingdom. Don’t let the wrong-headed impulses of the religious establishment influence you to focus on the wrong things.